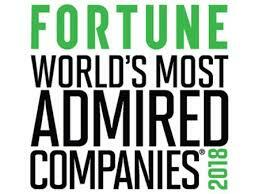 Xcel Energy, a wind company with more than 200 miles of electric transmission lines in Oklahoma was recognized by Fortune Magazine as one of the World’s Most Admired Companies. It is the fifth consecutive year the company made the national magazine’s list and is ranked the second most admired electrical and gas company in the U.S.
“We’re honored to be recognized as an industry leader by Fortune magazine. This shows that industry peers recognize the value we bring to our customers and is a direct reflection of our employees’ dedication to delivering clean, reliable and affordable energy to the communities we serve,” said Ben Fowke, chairman, president and CEO, Xcel Energy. Xcel Energy recently announced its vision to achieve 100 percent carbon-free electricity by 2050, the first utility in the nation to do so. It also plans to reduce carbon emissions 80 percent from 2005 levels by 2030, while keeping bills low for customers.